You know SEO is important to the success of your WordPress website, but when’s the last time you looked under the hood to evaluate your SEO performance? In this blog post, we’ll walk you through the tools, steps and questions to conduct your own WordPress SEO audit. By evaluating the most important factors that impact your search engine optimization performance, you’ll ensure that your website is operating at its optimal level. 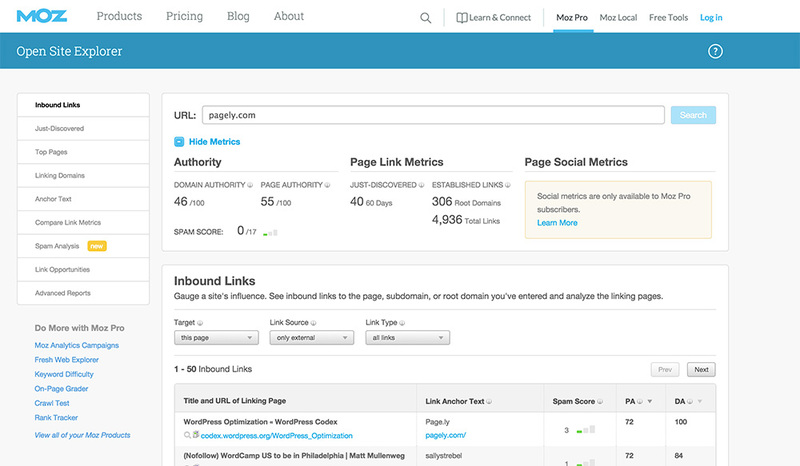 Below are the issues we believe to be the most important for a WordPress SEO Audit. 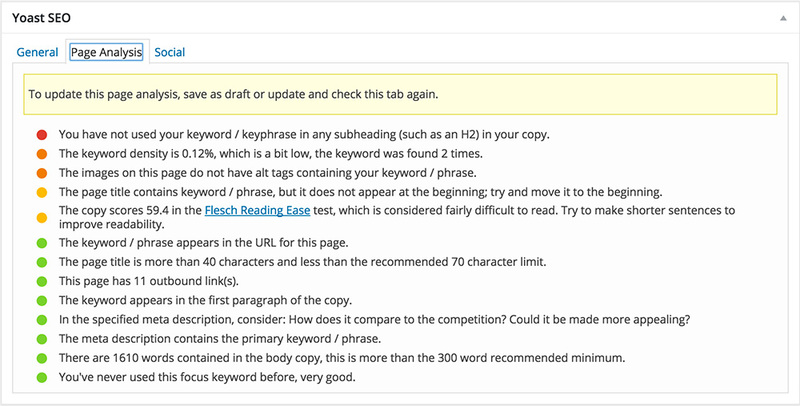 If you’d like to follow along with an example SEO audit, you can find an example here. Google Webmaster Tools (Search Console) – useful to identify 404 errors, duplicate content, malicious URLs and find out what keywords the site is ranking for. Screaming Frog – useful for evaluating onsite SEO elements like page titles, meta descriptions, alt tags, URLs and more. SpyFu or SEMRush – find out what keywords the site’s competition is ranking for. Indexing refers to how your WordPress website is submitted and read by search engines. The most important element in the indexing portion of the audit is looking at the sitemap. If you’re using the Yoast SEO plugin and have enabled the XML sitemap functionality, your sitemap will reside at www.yourdomain.com/sitemap_index.xml. The Yoast generated sitemap is great at following proper XML protocol and making sure that duplicate or broken URLs are not included in the sitemap. Visit the Google Search Console to see if the correct sitemap URL has been submitted. Is the sitemap clean and functional? How many pages are being submitted and indexed by Google? Are any pages being excluded from the sitemap that should be included? Accessibility refers to how your site is crawled by search engines. There’s two things to really pay attention to in this section of the audit: website speed and trends of 404 and 500 errors. Conduct two-speed tests – one at GTMetrix and the other at Google Developers. Both will give you plenty of insight and next steps to take to speed up your site. How is my website’s overall speed performance? Particularly, do the top 10 landing pages load quickly? Are my WordPress URLs search engine friendly? If I have 500 errors, is it time to make a switch to a new WordPress hosting provider? Site architecture refers to a user’s experience with your website navigation. With WordPress websites, overuse of “tags” and “categories” are usually two areas to pay attention to. Identify top 10 landing pages on the website and make sure that these URLs either have direct links from the homepage or navigation or are accessible within two clicks from any page on the site. You want your top landing pages easily discoverable and you want them to maintain their search position. See if your categories and tags are included in your sitemap. If they are being indexed, make sure that each category and tag has a clear purpose and contains unique content to engage an organic search visitor. Identify your most valuable and profitable web pages. Are these pages easily accessible from your top landing pages? If I were visiting my website for the first time as a potential customer, would I consider the organization of my website to be intuitive? Do I have too many category pages? Too many tags? Is it easy for potential customers to discover my most valuable content on the website? Keywords analysis evaluates how you and your competition appear in organic search rankings. 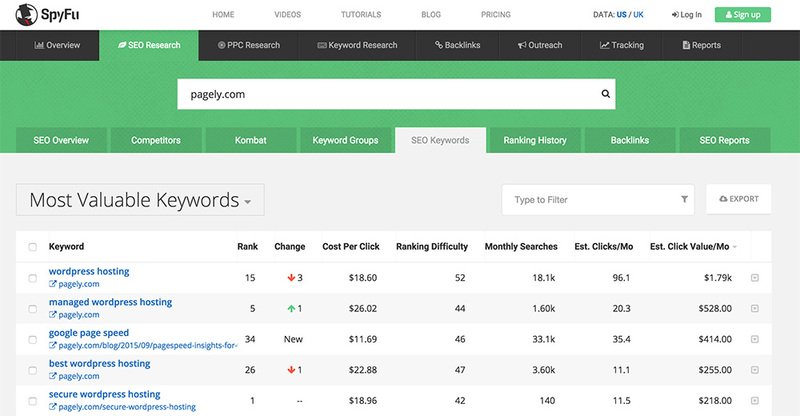 Identify the keywords your competition is ranking for using a free trial of SpyFu or SEMRush. Identify the keywords your competition is buying using SpyFu or SEMRush. Identify the keywords you are ranking for. Identify the keywords you’re buying that are converting like wildfire. Identify the keywords that you want to rank for. Evaluate how you stack up against the competition. Identify the keywords or keyphrases of your homepage title tag. Do the keywords you’re ranking for and getting traffic for drive value for your business? Are you tracking the progress you’re making towards the keywords that you want to rank for? Are the keywords you want to rank for so difficult that you’ll need to buy ads to appear for keyword searches? What are your SEO strengths against your competition? What are your weaknesses? Where are your opportunities? Does the title tag of your home page say “Home” or “Welcome”? If so, you’ll want to change it to a keyword specific to your line of business. If I’m buying keywords that are converting, are these keywords that I’m also targeting organically? Link analysis refers to both the external and internal links relating to your site. Visit Open Site Explorer and discover your most valuable links. Does my top linked pages coordinate with my top organic pages? Does my internal linking structure link to my best content? Can I add more links to my content on blog posts and content related pages? What content is getting the most links from external websites and why? What can be replicated and changed with my external linking strategy, given what I know about who is linking to me and how they are linking to me? Visit Google’s Mobile-Friendly tool and test top 5 traffic pages to see if they are mobile friendly. Visit top 5 traffic pages on a mobile device to learn more about the customer experience. If my website is not mobile friendly, how has my organic search traffic been affected since April 2015? Has it declined? If my website is not mobile friendly, should I install the WPtouch plugin to make my site mobile friendly, or is there a comparable WordPress theme I can activate to make the site mobile-friendly? On-page optimization refers to the SEO factors that influence search rankings. Yoast SEO is a great WordPress plugin that helps you improve key on page optimization features. Visit your top 50 traffic pages to see what Yoast suggestions exist to improve the on-page optimization. Review Screaming Frog crawl to see if images are optimized for SEO. Review Screaming Frog crawl to identify page titles that surpass 70 characters. Review Screaming Frog crawl to identify meta descriptions that surpass 155 characters. Review Screaming Frog HTML improvements to see what other on page elements need to be addressed. Are my page titles optimized? Am I missing any page titles or meta descriptions? Do my meta descriptions have strong calls to action? Am I following everything that Yoast is recommending? What is your content doing to help you drive business? Are any of your images generating search impressions? If so, perform a reverse image search using TinEye to see if anyone is using your images. If they are, write to them letting them know that you’d appreciate proper attribution with a link back to your site. Search for snippets on Google of your most popular content to see if your content is being scraped or duplicated. If you discover duplicate content, submit a removal request to Google. 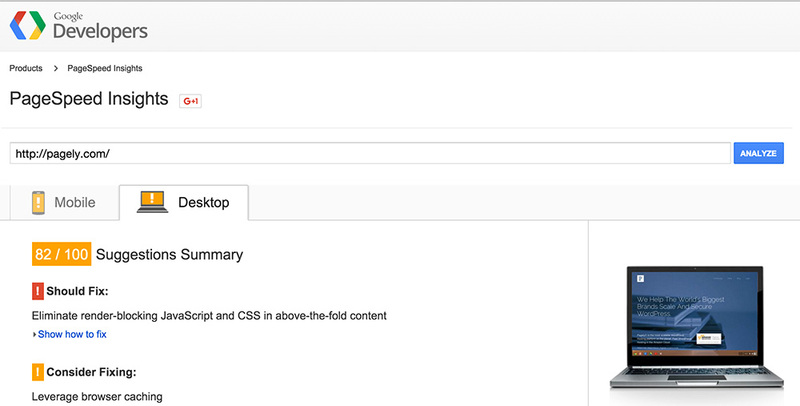 Review Google Search Console under “Search Appearance” -> “HTML Improvements” to identify any content issues. Is your content unique and not duplicated? Is your content well formatted with visual calls to action? Do I need to take action on any content copyright violations? At the end of the audit, you will have a lot of items on your to-do list. It’s important to categorize these findings into high, medium and low priorities and assign a timeline to yourself to address these issues. Making a strategic decision to address your audit findings will likely bring the most efficient results to your WordPress website moving forward. If you’ve recently audited your WordPress site, please share your experience and/or questions/issues in the comments section below. Brett Farmiloe is the Founder of Markitors, a provider of independent digital marketing audits. Aggregating information across 90+ authoritative marketing tools, Markitors is designed to add value and improve the information from which marketing decisions are made. Download a SEO audit example or connect with Brett on LinkedIn. I like the reverse image search. I use a similar technique with Flickr by uploading a lot of images with a creative commons license. If a user embeds the image, it always uses the same attribution to my Flickr account. Then once a month I’ll search in Google for the “past month” with the exact attribution to find where the images are being used. If it is a quality site, I’ll nicely ask if they will switch the link from Flickr to my site. Most reputable sites make the change. You forgot about DeepCrawl the best tool (in my view) for an audit.